Aside from photography, I occasionally host creative workshops that aim to help people going through grief. This wasn’t a thing I planned… more a thing I felt called into after experiencing my own deep loss and the way creativity helped to carry me through those dark days. So for the second year, I was invited to present my workshop at a conference by Soaring Spirits International, an organization for widowed people. I’ve gone to this conference, called Camp Widow, as an attendee working through my own grief, and now as a presenter to give something back to others. It has been a godsend on this journey through widowhood, and a place I feel so honored to present. I was a ball of nerves the day of my workshop. I’m never certain how things will unfold, but I always want to badly for it to give others what I hope it will give them… a new way to look at moving forward and new ways to reframe their loss. 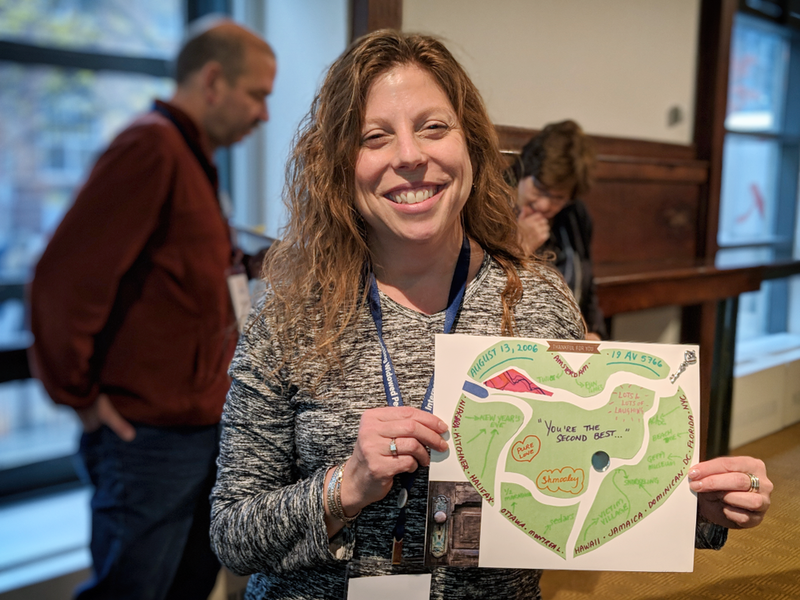 I have to say, there really are few times in my life when something has unfolded to be even more amazing than what I imagined in my mind... and this workshop did just that. More importantly, the PEOPLE in this workshop did just that. Everyone shared their stories, their loss, their pain, but most importantly... their LOVE. They cried and laughed together as they created something meaningful... something tangible to take home with them that - I hope - will serve as a reminder that broken is beautiful. That we have the power to re-create our hearts and to bring our loved ones along with us in whatever life we make for ourselves going forward. And that we heal better when we heal together, and share our stories and our experience with others. I cannot express my gratitude for these folks trusting me with their hearts, and my pride in their courage. 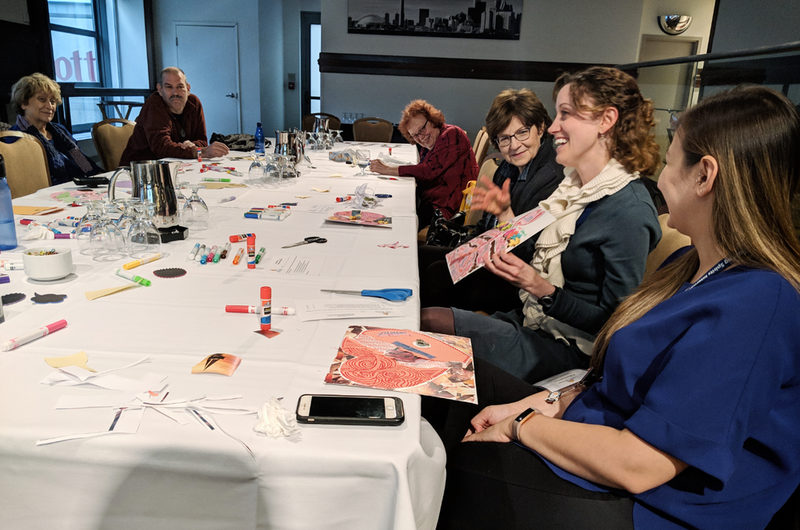 My workshop is not arts and crafts… I actually asked them to do some really hard stuff and they just blew me away with their vulnerability and their creativity. There was no doubt that each and every person enjoyed the time we shared together. I arrived home with a heart so very full. It's funny sometimes, where life can take us. I honestly never imagined I'd be someplace like this. I never imagined I'd be widowed at 30. I never imagined I'd be in a new relationship with a widower, and a mom to his daughter. I never imagined I'd ever have the confidence to lead a workshop at all, much less one that deals with such an emotional and sensitive topic as grief. I hate public speaking in fact… and I find it terribly uncomfortable to stand up in front of any group of people and claim that I know what I’m talking about. Me? You’re going to listen to ME? Are you sure that’s a good idea??? It’s taken a LOT of personal growth and some big leaps outside my comfort zone the past few years to realize that actually, yes, it might just be a good idea to listen to me. That I actually have gained a lot of experience in ways to work through grief over my lifetime and multiple losses and I have valuable stuff to share. I was once a girl who thought she had nothing of value to give to the world. Who stayed small and quiet and afraid, and who kept everything at a distance because I didn’t believe I deserved good things. Oddly enough, my fiance's death was a big part of what began to change that. There was a gift he left me in the darkness, and that gift was realizing that I had something valuable to share. I can give someone else hope. I can encourage their creativity. I can be a friend they can lean on. I can stand beside them in their pain and not shy away from it. I can be a lighthouse to someone else who is going through something and help them to see that they can make it through the dark too. And I can help someone else realize that they can do all of those things for someone else too, just the way others taught me to do. Now six years past one of the darkest days in my life, I can say I've put my broken pieces back together, into a new version of me. I've kept many pieces from the past, but there are a lot that I have left out. The pieces that said I'm not good enough, or strong enough, or have no value... those are the ones I've worked to leave behind. And continue to work hard to leave behind. Every time I look at these pictures from my workshop, I am reminded of what a journey it has been. How unreal it all seems that this girl who once felt so small and powerless has become a woman who knows that she has something valuable to share with others. I used to dream of being "the kind of person who could do things like that". Now I realize, we all have the capacity to give something valuable... because our story itself IS valuable and when we share it, we connect with someone else. We inspire them, give them hope, and help them realize the value in their story, too.